Opportunities for recreation and physical activity are essential for personal and community health. Yet many communities across the country do not have enough safe, affordable, high-quality spaces for play, exercise, and recreation. 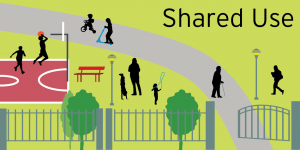 Shared use agreements—also known as joint use agreements, memoranda of understanding, and contracts—allow public and private property owners to broaden access to their underutilized facilities for community use. Shared use agreements can be used in a wide range of settings. They can involve a variety of partners and achieve goals that are unique to a particular community or locale. As a widely promoted strategy to create opportunities for physical activity, shared use is particularly useful for cities and towns that want more park spaces. Shared use agreements are not a substitute for adequate public infrastructure investments, but they can be an important component of larger initiatives to promote healthy living and advance health equity. Regular physical activity is crucial for the prevention and control of chronic disease. Access to nutritious food through shared use community gardens and farmers markets helps address obesity, hunger, and poor nutrition. Shared use agreements maximize the impact of existing facilities; they are an efficient and economical use of resources. See our other shared use resources for more information about this effective strategy for improving public health and well-being. For questions about adapting our shared use resources for your local needs, please contact us or a local attorney. Subscribe to our emails, and support our work.